This Montana ranch. less than a hours drive from Great Falls, is being offered for sale by a motivated seller. With a second major price reduction this Ranch with one and a half miles of Smith Creek running through its core provides outstanding fly fishing and wing-shooting. Live from New York ... It's Swan Land Company's listing and sale of the Broken O Ranch. 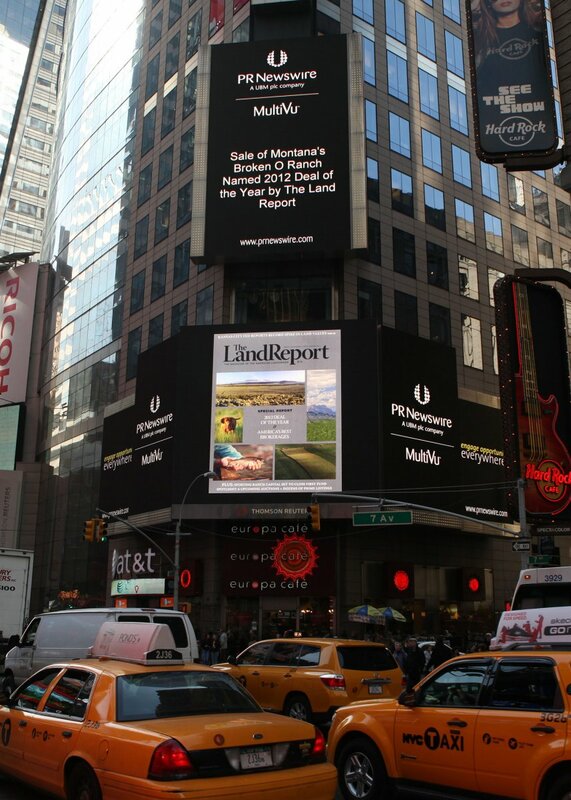 The Land Report announces Mike Swan's listing and sale of the Broken O Ranch as the 2012 Deal of the Year! The Lazy J Ranch is the largest remaining privately-held contiguous block of land in Bridger Canyon. This Montana ranch is being offered for sale for the first time in over fifty years. The 5,665-acre mountain ranch is represented by Swan Land Company in Bozeman and is being offered for sale at $40 million. We are excited to welcome Tim Anderson as the newest member of Swan Land Company. Tim brings extensive experience in resort and recreation real estate to the team. As a lifefime Montana resident, he has explored every corner of the Big Sky country - its beautiful land and unique people. Prior to joining Swan Land Company, Tim spent 12 years with Montana Real Estate Co. With his wife, Leesa, they guided the successful real estate sales effort for Moonlight Basin Ranch and has worked in every aspect of the real estate spectrum from development and product design to financing, marketing and sales. After 12 years in the Montana ranch real estate market, Mike Swan is launching Swan Land Company. His office is well established in the Rocky Mountain West and will continue to represent premier western properties from their office in Bozeman, Montana. A Big Sky country native and Montana State University alum, Swan is intimately familiar with the Montana land market. For the last eight years, he has been Managing Broker of the Bozeman office of Bates Sanders Swan Land Company and has established a solid foundation in the ranch brokerage arena. “We are in an ideal position to grow Swan Land Company’s already-extensive Montana real estate and ranch brokerage presence,” Swan stated. This week we closed the chapter on one of the most significant ranch transactions in the history of the Rocky Mountain West. The sale of the Broken O Ranch to Stan Kroenke is a signal transaction in our western real estate market as well as the Sun River Valley of Montana. Great Falls, Mont. – Located along the Sun River near Augusta, Montana, the 124,000-acre Broken O Ranch, one of the most expansive and versatile agricultural operations in The Rocky Mountain West, has been purchased by American business entrepreneur Stan Kroenke. The Moore family has spent nearly 25 years assembling this massive land holding. Spread across Lewis & Clark, Cascade and Teton Counties, the Broken O was carefully shaped and improved to create one of the most grand and significant agricultural enterprises in the United States. With the close of the big game hunting season, now is the time to grab your dogs and take to the field. Upland game bird hunting season is in full swing. The Montana Fish, Wildlife and Parks department provides a wealth of pertinent and interesting information to broaden your knowledge base before you head out into the field. The Shortridge Ranch on Smith Creek, historically known as the Shoco Ranch, is located four miles from beautiful and historic Augusta, Montana. In the shadows of one of the most magnificent mountain features in the West – the Rocky Mountain Front and Haystack Butte, the Ranch straddles about one and a half miles of Smith Creek, one of the finest personal-sized trout streams in the area.